THIS BLOG POST ORIGINALLY APPEARED ON BLOG.FH.ORG. WRITTEN BY Tim Smith. Think with me for a moment about Chukuke, an 8-year-old girl growing up in Africa. She lives in one of the more arid regions of East Africa. She does not go to school. She had to drop out. She spends every day walking 9 to 10 miles to find clean water for her household. She doesn’t play with her friends. She doesn’t learn to read and write. She loses her childhood. She seldom eats breakfast or lunch. She will never finish school. 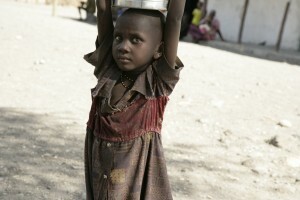 Young girls like Chukuke are the casualties in regions where clean water is so sparse. This is the power and impact of water in many regions where Food for the Hungry works in the developing world. Water can provide life, health and survival for families. The scarcity of it creates despair, disease and loss of hope. Recently, I traveled to Addis Ababa to visit Food for the Hungry’s work in Ethiopia. While I was there, I sat down with Shep Owen, FH Africa Regional Director. We talked about how the lack of clean water affects impoverished families. FH has long recognized that girls and their access to school are tightly related to access to water, especially in water stressed regions. Often girls are the first children to be kept home to do household chores—such as securing water daily. Shep said that the United Nations estimates that only one in six people globally have access to an improved water point. This means so many little girls are facing experiences like Chukuke. This month—as we consider the challenges of people without clean water—let’s take time to give a little extra to combat this problem. Next time you sit down and drink a glass or bottle of clean, purified water…take a moment and think about Chukuke. Offer a prayer for her and others like her, then get involved. Partner with us at Food for the Hungry as we strive to find a clean water source for Chukuke, so she can go back to school and live the life of an 8 year old.